Florida senator Bill Nelson (D.) is labeling himself as a career-long opponent to drilling off his state's coast, but he briefly dropped his guard during former president Barack Obama's first term. Nelson, facing reelection this November, was "fuming" last week after Interior Secretary Ryan Zinke announced he was reversing plans to open up Florida's coast to drilling and said the decision was made at the urging of Republican governor Rick Scott, his possible November opponent. Nelson took to the Senate floor to call the announcement a "political stunt" and brag that he's been fighting offshore drilling since he was in the House of Representatives in the 1980s. He told Zinke in a letter he's "fought to keep drilling away from Florida's coasts for decades now" and put out a separate statement to reporters portraying himself as the last line of defense for the coasts. Nelson's opposition to drilling off Florida's coast, however, hasn't been as consistent as he portrays—in 2010, he shocked environmentalists when he threw his support behind an Obama administration proposal for drilling 125 miles from Florida. He defended his reversal by pointing to agreement from a former state environment official. "Also okay with the deal is former Florida DEP chief Carol Browner, now assistant to the president for energy and climate change," Nelson said. "She said in a conference call that the 125-mile buffer is good protection for the state." The Sarasota Herald Tribune reported that environmentalists felt "betrayed" by Nelson. 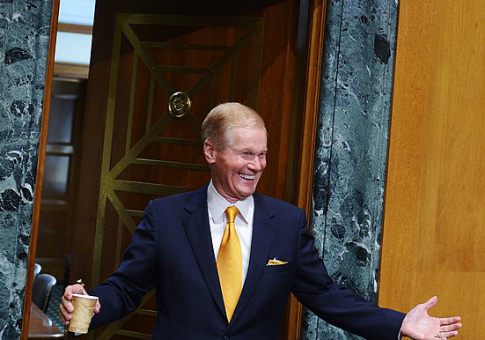 "For most of the past decade Sen. Bill Nelson has been a leader in repelling attempts to drill for oil off Florida," the paper wrote. "But on Wednesday, just as Obama announced plans to allow rigs 125 miles from Sarasota—100 miles closer than currently allowed—Nelson gave his tacit approval to the deal." Exactly three weeks after Nelson announced his support for the drilling plan came the April 20, 2010, Deepwater Horizon oil rig explosion that spewed 4.9 million barrels of oil into the Gulf of Mexico. Though it was located more than 125 miles from the coast, the oil reached the Florida coast. Asked for comment on Nelson's 2010 support for Obama's plan to open up drilling off Florida's coast, Nelson’s Senate office denied he ever supported the plan. Follow-up questions asked about his 2010 statement and reporting by the Sarasota Herald Tribune on Nelson's support for the Obama plan did not impact Brown. "Nelson never endorsed such a plan," Brown said in a second email. This entry was posted in Politics and tagged Barack Obama, Bill Nelson, Drilling. Bookmark the permalink.